Kayaking is one of the best recreational activities out there to enjoy. However, owning a kayak comes with its challenges of sporting to the ideal kayaking place. This where kayak carts come into place to help you transport your kayak safely. If you’re shopping around for kayak carts, then you need to choose the best. There are hundreds of these carts and selecting the best requires a keen eye for detail and some experience. However, if you’re reading this post, then you’ve come to the right place to choose the best kayak cart. We’ve searched through the internet and reviewed for you ten best carts that we believe we make kayak transportation a lot easier. Read through our reviews below and find yourself a kayak cart that will serve you well. This is a big 150-pound capacity kayak cart with lynchpins and stainless steel fasteners to keep your kayak stable during transportation. There is a further 12 feet strap to enable you fastens your kayak and make transportation easier. The construction of this cart is the durable aluminum pipe with 20 by 20mm anodized steel. It is easy to use and also breaks down to allow for easy storage. The cart features 9-1/4 inch high spring load to keep the cart propped onshore. This allows for easy loading out water. 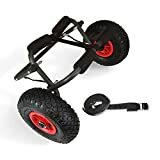 The tires are 9.5 inches flat to offer stable support on uneven grounds. This is a deluxe kayak cart with 12 feet down strap and a solid steel frame for easy installation. It is a 120-pound high capacity cart with foam bumpers on each side to protect your kayak. 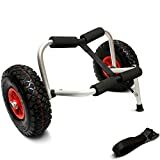 The kayak features large 9.5-inch diameter and 3.5 inches wide tires for easy rolling on uneven grounds. It is durable aluminum construction with 20 by 20mm steel anodizing for durability. The stand support features a 9.25 inches loaded spring for propping the dolly cart onshore. 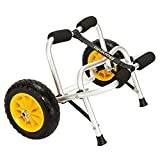 Overall, this cart will easily rest any kayak and strap it down for fast transportation. The Bonnlo Kayak cart is a generous 165-pound capacity cart and one of the best picks if you have a large kayak. It is a solid aluminum frame construction cart with foam bumpers to protect your kayak. Each arm of the cart features a foam bumper that prevents scratches and dents to your kayak when on the road. It features rubber tires that are full solid and without any smell. These tires run smoothly on sand and gravel making them the perfect way to get your kayak to the riverside. The stand is spring loaded for easy loading. The FDW kayak cart is one of the strongest 195-pound capacity choices with sturdy construction and large 10-inch wheels for easy movement. The cart features a one dolly cart tie-down strap that holds your kayak in place. It is a large 13 by 22 by 9.2 inches kayak with two large wheels and a lynchpin. It also breaks down quickly to allow for storage. The pneumatic wheels roll smoothly on sand taking your kayak to the waters safely. The ABN universal cart just as the name suggests is a universal choice for carrying kayaks, boats, and canoes to the waters with ease. It is a durable and high standard cart with 200-pound weight capacity. 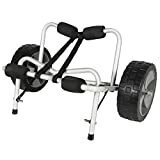 It features a high-strength steel frame that ensures durability while keeping the cart lightweight. The 9.5 inches tires are easy to inflate and allow for easy movement on rough areas. For maximum protection of your kayak, the cart features oversized foam bumpers on the arms. Other fantastic features include a 12-foot tie down strap, spring loaded kickstand and easy folding for storage. The Best Choice Products Kayak cart brand is a great buy from a trusted brand. It is a simple but pretty durable kayak cart made of a sturdy and durable aluminum frame construction. The structure is lightweight but pretty durable capable of holding 150 pounds of weight. The 10-inch PU foam wheels can smoothly roll on sand and gravel taking your kayak to the water edges. 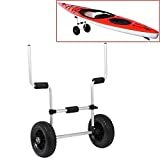 The Yaheeteck kayak cart is one of the most straightforward designs that can easily be carried and stored anywhere you want with ease. It is a durable aluminum frame construction cart with a rubber bumper to protect your kayak on the arms. It a great design that fits kayaks featuring ¾-inches scupper holes diameter. The surface of the cart is sprayed with a powder coated finish for long-lasting use. 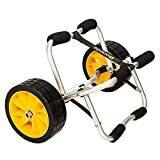 The two 9.4 inches wheels are durable and spin smoothly for faster movement. This is another high-grade aluminum frame construction kayak cart with a 132 pounds weight capacity. It is a strong pick to carry your kayak, canoe, and paddles with ease easily. You can easily carry your boat with ease whether the road if 500 feet from the water or less. Foam bumpers on this kayak help keep the kayak dent and scratch free as you move through uneven roads. Overall, it is an excellent cart with a clever foldable design that allows for easy storage. 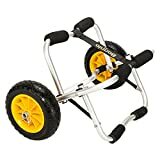 The Bonnlo is a trusted cart trailer with solid tires that roll smoothly over gravel and sand transporting your kayak safely. The cart holds a maximum 165 pounds kayak which is a good range for most kayaks. It is a durable aluminum frame construction with foam bumpers on the arms to prevent scratches and dents. It is easy to assemble and breaks down fast allowing for storage. There is a 10-inch spring loaded stand to keep the cart propped and two 5-feet bungee cords for hooking. The Bonnlo Boat Kayak cart is the best pick on our list with a broad range of features that make it easy to use. This cart features a 10-inch spring loaded stand and solid tires. 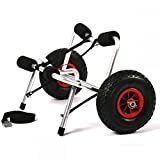 The stand allows for quick kayak loading out of the water while the 10-inch solid wheels move smoothly on sand and gravel. It is a sturdy and durable pick with 165 pounds weight capacity. Overall, this cart will come with all accessories for easy use out of the box. Some of the accessories include a 12 feet tie down strap and two five feet bungee cords. Moving your kayak from one area to another can be a problem but with the right kayak cart, transporting it is pretty easy. Go right ahead and pick the best kayak cart for your boat, canoe, and kayak today as you look to spend more time kayaking.